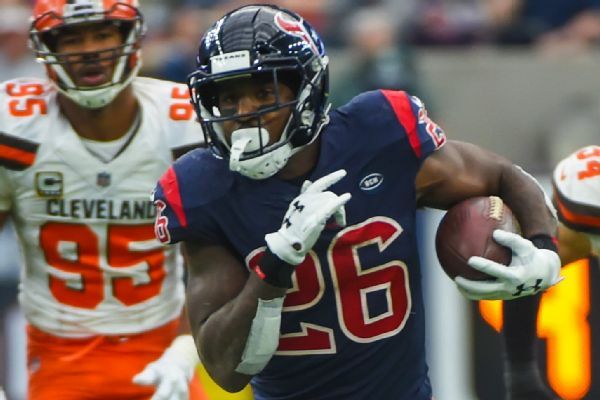 HOUSTON -- When Brian Gaine was asked at the NFL scouting combine whether he saw Lamar Miller as the team’s starting running back in 2019, the Houston Texans’ general manager didn’t hesitate to say yes. Even though there were options to bolster the running back position in free agency -- namely Le’Veon Bell, who eventually signed a four-year, $52.5 million contract with the New York Jets -- the Texans' front office and coaching staff said they were confident in their options at the position. And because of the confidence that Gaine and head coach Bill O’Brien have shown, it means this is an even bigger year for Miller and fellow running back D’Onta Foreman. Lamar Miller has averaged 978 rushing yards per season in his three seasons in Houston. Foreman, who returned late last season from an Achilles injury suffered in his rookie season in 2017, rushed for minus-1 yard in seven carries in one regular-season game and had a 3-yard rush in the playoff loss to the Colts. He must seize on a chance to show he can play next to quarterback Deshaun Watson for the foreseeable future. Miller is coming off of his best season in Houston, rushing for 973 yards and five touchdowns on 210 carries in 14 games. The Texans tried to manage Miller’s reps last season even without Foreman available, as they wanted to avoid overloading their veteran running back. The coaching staff also elected to sit Miller for two games while he was dealing with injuries to his ribs and ankle during the season. The Texans need to get more from Foreman, their third-round draft pick in 2017. And although O’Brien said Foreman was “rusty” at the end of last season because he hadn’t played a lot of football, by the end of the season, the coach believed Foreman’s speed and ability to cut and change direction had returned. The Texans will need to add at least a third running back to the group now that Alfred Blue is a free agent, and they could sign a veteran this spring or take a back later in the draft. It’s clear Houston hopes to count heavily on Foreman in 2019 and beyond. “I think anytime you get injured your rookie year, I think that’s hard,” O’Brien said. “He tore the Achilles his rookie year and that’s a tough rehab for a young player, a running back especially. There were some ups and downs with the rehab. He worked at the rehab, but at the end of the day, he just really wasn’t on schedule until the end of the year.